The Parliament Hotel brings together all that is best about being in Dublin. The hotel is an attraction in itself, with its eye catching contemporary interior, plus stay here and you'll be right beside Temple Bar, one of the city's most fashionable and exciting districts. The Parliament Hotel is friendly, comfortable, a perfect choice for your visit to Dublin. There are 63 rooms available, all extremely comfortable, well-equipped and very inviting. Each one is a wonderful base to begin your exploration of Dublin. In addition to standard Double & Twin Rooms, there are a number of Triple & Family Rooms which make the hotel ideal for familes and groups. 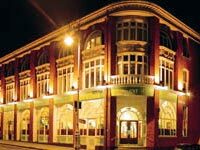 The hotel contains a popular bar, the Forum, which is frequented by both residents and non-residents alike, providing you with a great opportunity to mingle with Dubliners. Equally convivial is the hotel restaurant, the Senate Room, which serves mouth-watering international cuisine. The hotel is also close to Christ Church Cathedral, Dublin Castle and the world-famous Trinity College. For shopping - just take a right at Trinity College and you'll arrive at Grafton Street, Ireland's premier shopping district. You will be in the heart of this vibrant city.